It's been a heck of a winter. Cold, long, bleak, seemingly endless. Massachusetts had a blizzard on Wednesday, assuming you lived out on Cape Cod, but it still reminds me that I live in New England and the phrase "snow in May" is not as alien as one may believe up here. This weekend was the Manchester, NH St. Patrick's Day parade. It would have been a nice, short parade that mirrors the route of the Christmas parade. Only during the day. In March. Instead of December. At night. Sadly, it was cold, rainy, and we (the Legion) didn't want to potentially ruin hundreds of dollars worth of costumes. So we cancelled. I planned to wear my green Jedi outfit, and my dad was to be returning to (kinda) active duty by borrowing my Scout Trooper. We had a bit of a dress-up day this past weekend to see how it fit; it fit him better than it did me, that's for sure. So much so that I'm going to have to pin a few things in place to make sure they stay where they need to; like the belt. It also sparked a discussion of "I could see getting one of these". So now we add Scout Trooper to the growing list of costumes my dad would like to do, joining the ranks of Royal Guardsman, Imperial Grand Admiral, and Tusken Raider. A notice just posted that Sam Witwer will be coming to the Boston Comic Con in August. I'm excited, but apprehensive. Because of my peripheral contact with him on the Order 66 podcast, and meeting him once at DragonCon, there are times where my ego thinks I've got more of a relationship with him than I actually do. "I really feel like he's a buddy! We're both gamers, and Star Wars Nerds, and we've been in the same guilds together online!" Pffffft! Means exactly as much as the value of the webpage this is posting to. Still, it will be cool to say "hi". Maybe Erich and I can get him to do an interview for AWRI, assuming that's still alive by then. I also don't want to come across as a complete psycho stalker (a.k.a. "A nutter"). There's a fine line there, and I'm very cautious about not crossing it. Eh, I over-think things too much. He'll show up, we'll chat or we won't. BCC will be fun regardless. My Order 65 campaign had another session this past weekend. Here the PCs were able to manipulate the senate into hearing charges against Chancellor Kenobi, charges that implicated him in the murder of Chancellor Amidala twenty years previous. Kenobi was arrested, and his former padawans attempted to rescue him. It was a vicious fight where the PCs faced off against an Enhanced Nemesis (Kenobi), and two regular Nemesis NPCs (Master Ahsoka Tano and Satine Naberrie/Leia). I got to see just how painful Enhanced Nemesis characters are, and what someone can do with a Force Rating of 6. 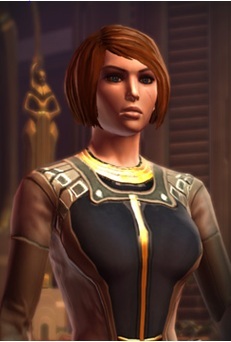 I also saw how painful lightsabers can be; the only reason Kimber's Jedi Knight lived was because she went "Old Republic" and picked up some Heavy Battle Armor and Lucas rolled well enough on a Streetwise check to locate a Cortosis weave attachment. Just a quick update for now. This Thursday I hope to have the first of many PC stats for my GenCon Module. And maybe March can finally be over. Today I learned something new, or tried. I finally learned how to set up Blogger so I can write the post, send it to Blogger as an email, and have it turn that email into a draft. This will hopefully circumvent the problems I've been having updating the blog from work, where the work computers won't interface with Blogger because they purposefully have to keep IE at an earlier version than 90% of the frikkin' Internet. That's the way it should have worked, anyway. The problem is the email address must not be set up right, because the blog post I emailed to the address I selected has yet to show up in my Drafts list. Oh well, better a day late than not at all. Last week when I posted about a module idea for GenCon (and learned that the spellchecker on my tablet needs work). Since that post, it's been like the creative floodgates in my mind have opened and development ideas are flowing out onto the proverbial (computer) page. It's been crazy; I blink and there's a new scene, a new idea, a new encounter that I don't think has ever been done before in Star Wars. It should be, as my brother said when he read about the premise, "HI-larious". I wanted to write something "fun". I don't often write games that specifically are designed to take place in single sessions, but for GenCon this is pretty much a requirement. I may be able to run this once, or I might get the chance to run it several times. Either way, I want to squeeze it in to a 4 hour block; the standard gaming block for Con Games, as I've encountered it. So the game needs a set-up, a few encounters, and a finish, all in four hours or less (hopefully, not much less). The idea I had for the party was simple, yet elegant; the PCs are the Companions from the heroes of Star Wars The Old Republic. Originally, I was going to just use the "romantic interest" characters, and pull them from all four Republic Classes (sorry, Empire-lovers, no Sith-side characters in this adventure). That would have given a decent swath of characters to chose from. It seemed balanced, initially. 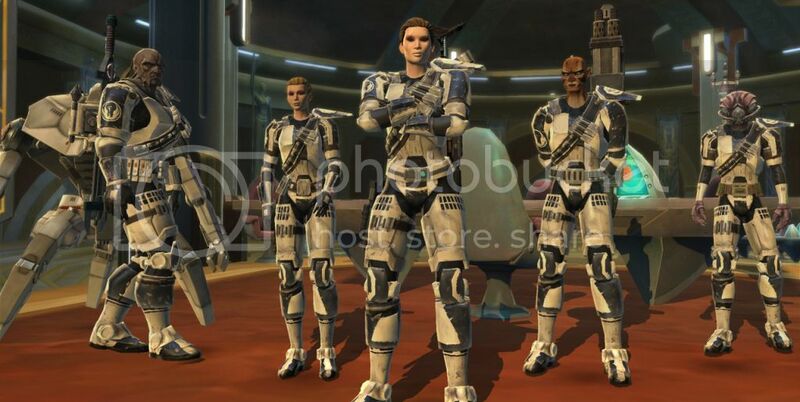 There are two damage-dealing Jedi-characters (Kira and Nadia), two healers (Doc and Elara), two tanks (Corso and Irreso), and two ranged damage dealers (Aric and Risha). Each player would choose one of the heroes and play the "spouse" of that character; and that's where it went wrong. While it looks balanced, in actual character selection could miss out on key roles for survival. In one example, we could end up without any healers if the Knight player selected Kira instead of Doc and the Trooper player Aric instead of Elara. Also, from a set-up standpoint it seemed a little convoluted to have the spouses of the Heroes of the Republic all conveniently hanging out together while their husbands and wives are all off on some grand adventure they can't go on. That's when the next idea popped into my head that presented a solution. A big, work-intensive solution. The PCs wouldn't be drawn from all the heroes, they'd be the companions of one of the heroes. Each hero has five companions...okay, six if you count C2-N2. Each hero has five main companions; a damage dealing melee character, a damage dealing ranged character, a ranged tank, a melee tank, and a healer. That, right there, is a balanced combat party. Add to this that each of these characters have a fully fleshed out backstory, as well as stats that grant bonuses to certain skills in-game. These give us valuable insights into the non-combat skills they might possess in a Table-top game. For example, Aric grants crit bonuses to Diplomacy missions, which tells me he's probably got some Negotiate or Coerce in his skill tree. Sgt. 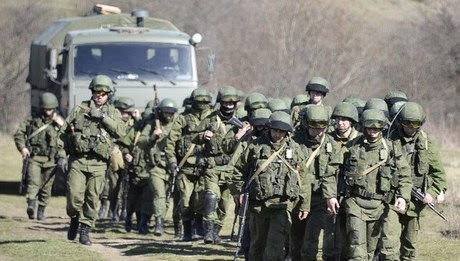 Rusk has led squads of troops, which hints at Leadership. Tharan is a brilliant scientist, qualifying him for Knowledge skills. Risha hid out with smugglers and crime-lords, and likely picked up a lot of Streetwise. And how do we get these PCs together? They already are! It makes a lot more sense for the Hero to be away from his or her ship, and have their entire crew left behind and available for a potential adventure while the Trooper is off fighting against Korugga the Hutt, or the Jedi Knight is off attacking the Maelstrom Prison for the umpteenth time. Since all the Flashpoints and Operations in SWTOR show the heroes being transported to their mission by a third party, they've even given me an excuse to explain why the Companions have the Hero's ship. So where does this being? It begins on Carrick station, the most likely point where the Hero is called away by the Republic, and their companions can relax and await their return. 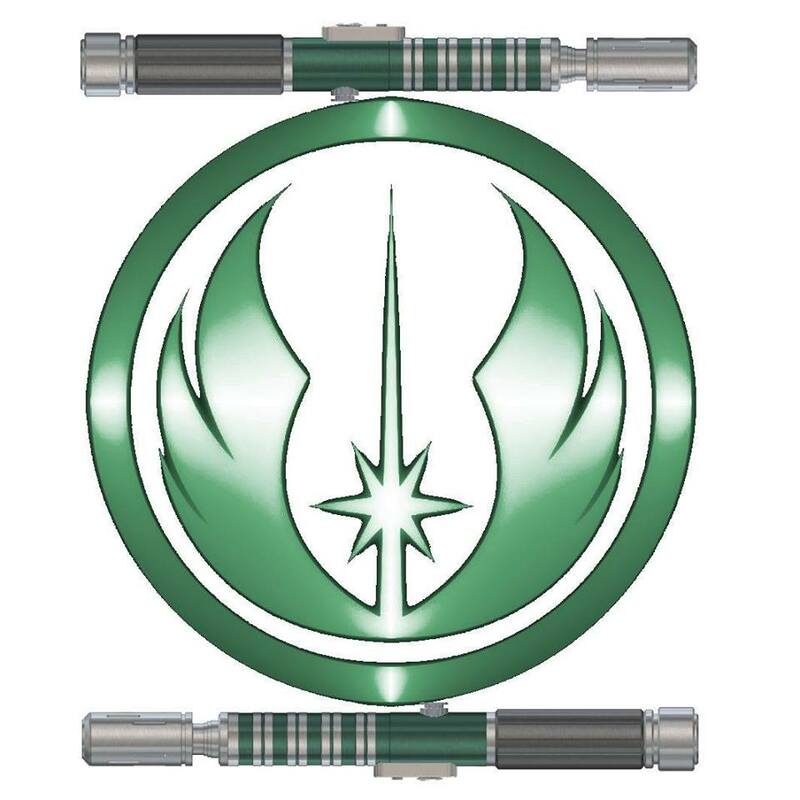 The ship's communicator sparks to life, presenting the logo from the Office of the Supreme Chancellor. Accepting the transmission, the Chancellor herself appears, seemingly relieved she reached the Hero's ship. She says that a situation has arisen that could mean the end of the Republic, or at least the loss of countless lives. She needs the Hero to undertake a mission to Nar Shadda, and discovers from the Companions that the Hero is currently unavailable. Out of time and luck, the Chancellor concedes that the Hero's Companions have proven resourceful in the past, and may be strong enough to save the Republic...not that she has any other options. The companions take their ship to Nar Shadda where they dive into the seedy underbelly of the criminals and evil-doers of the galaxy, attempting to complete a mission that pits them against cartels, crime lords, and even agents of the Empire. The only problem is that I don't just want to choose one hero and make a set of NPCs for that one crew. I mean, I could make it a Havoc Squad mission and stat out just those characters. I'm sure it would be fun, but I'd wonder how the Jedi Knight's team would complete the mission. Or the Smugglers. Or the Consulars. So why not stat out all the companion crews, and leave it to either group consensus or random chance to see which crew the players get to portray? Which means I get to come up with stats for 20 possible PCs! So expect the next few weeks...possibly months...to be filled with stats for Yuun, Doc, Qyzen, M1-T4, Bow'daar, and all the rest of the companions. And maybe even a surprise or two. Hey, it's a project. I can write about my projects. Right now in Texas the first few games of Gamer Nation Con are being played. Some good folks are sitting down with the celebrities of D20 Radio and beyond to get in three days of some damn good games. I, sadly, am not there. Finances being what they are I could only squeeze in one trip this year, so I've elected to go to GenCon. I shall endeavor to attend next year's GNC, however. This subject did get me on to thinking about what I want to do at GenCon. I've heard that some of the best games and experiences happened at pick-up games. I want to write a con module I can run out there, maybe two or three times. At least once for the Order 66 guys. For the life of me, I was having a hard time figuring out what to write. What to focus the story on. Tonight it hit me. A potentially fun theme, especially those fans of Bioware games. I'm calling it "Welcome to the Big Leagues", a one-shot module where the pcs are drawn from the companion characters of Star Wars The Old Republic. This will give me a subject to write about in the coming months, as I develop the character stats and module. I can share certain details with my readers, but there are a couple things I want to keep to myself (like, the plot). It should be fun to develop and share, and hopefully fun for you all to read along with. Final note: I'm writing this post with my tablet just before bed, because I wanted to maje sure this idea doesn’t fade away. It's also why its a short post, and lacking my usual imagry. My next pist should be full of more detail and pictures for you to enjoy. Sometimes you find inspiration in the weirdest of places. Okay, maybe not “weird”. 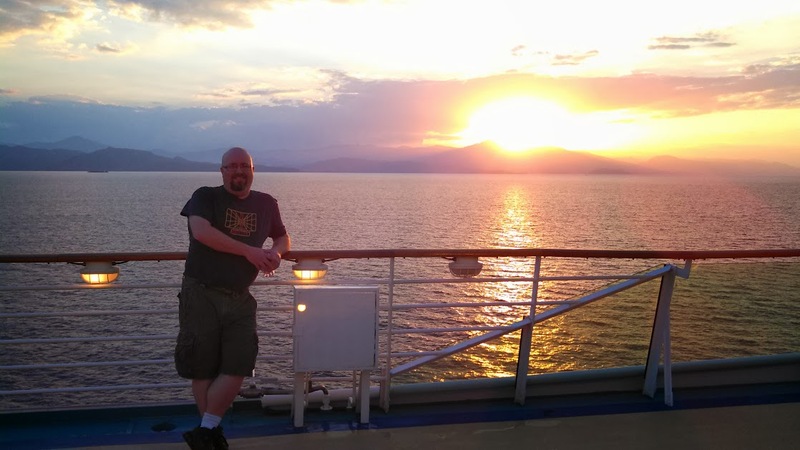 Let me explain; I’m currently steaming north westward in the middle of the ocean on the last day of a much needed vacation, and all I can think about right now is putting some of my thoughts and observations down for the blog. Don’t worry; I’ve been doing everything but this before now. 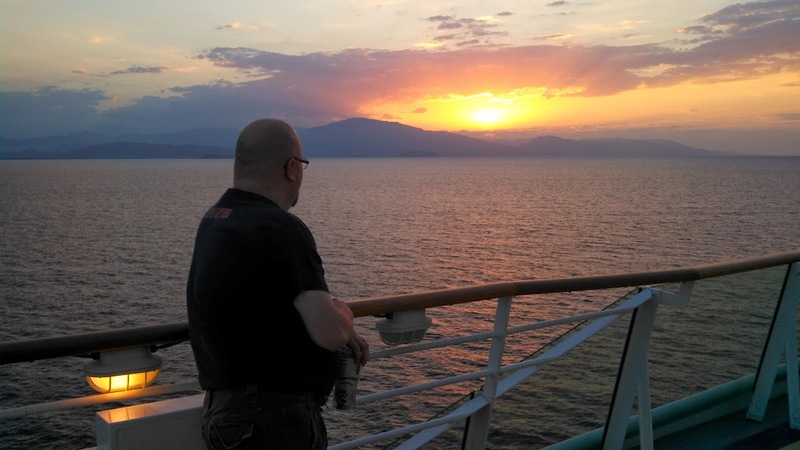 Dammit, I’m on a cruise ship with my wife, writing for this blog hasn’t been at the forefront of my mind until my last day at sea. Sometimes it’s hard for a GM to be inspired. Sometimes a GM finds inspiration when he’s not looking for it. But you can find ideas for your game everywhere and anywhere if you want to find them. Whenever I go away on vacation, I look for and try to find at least one thing in every location that I can build on for a game. It could be a location, a particular photograph, an interesting tale; something that I can work into a game and give it a unique texture and feel. I’m currently on a cruise hitting three island nations; Cayman, Jamaica, and Haiti. With two additional days purely at sea, Even if I only come up with one thing for each day, that’s five potential subjects for my games. Sometimes, I found more than one. Not that this happened…okay, it did and I’m really glad such a penultimate example of an aggressive drunk never made it only my cruise. But that’s what I’m talking about; inspiration. Drunken McAngrydrunk who’s had three too many beers and has decided that your PC who just rolled a Despair looked at his girlfriend wrong, and determines that the correct course of action is to punch your PC in the face is one heck of a complication to the chase scene through the starport. Gotta admit; I didn’t really come up with much of anything here. I’m sure I could find some person to mold an NPC after, but honestly for my first full day of vacation all I wanted to do was sit and let the brain go into idle-mode. Can you blame me? EDIT: Check that, I just remembered something while writing about Day Three below. There’s a Game Room on-board and like any child of the 80s I went and played a bit. The game Afterburner Climax has a zone called “Volcanic Islands” where you battle in the skies over a series of volcanoes, erupting into the air. If that’s not an exciting backdrop for a speeder chase or a dogfight, you need to get your pulse checked. Ah, the Cayman Islands. Fun Fact; 40 of the world’s 50 largest banks have branches in the Cayman Islands. The tiny island is flat. Very flat. I could see completely across it from the upper decks of the ship, which also should give you an idea how small the island is. Real Estate in this paradise is $4,000 per square foot. It’s “Seven Mile Beach” is considered one of the most beautiful in the world. Yet as we traveled from one location to another on the island, we pass homes and sometimes hovels for the natives of the island, just trying to get by on what scraps the rich, elite, and the not-always-rich-or-elite tourists would leave them. Cayman gave me the idea and feel of how an Outer Rim town feels; hints and images of galactic civilization mixed in with sub-standard construction methods, massive dichotomy between rich and poor, and populated by people doing everything to just survive no matter what social strata they fall into. 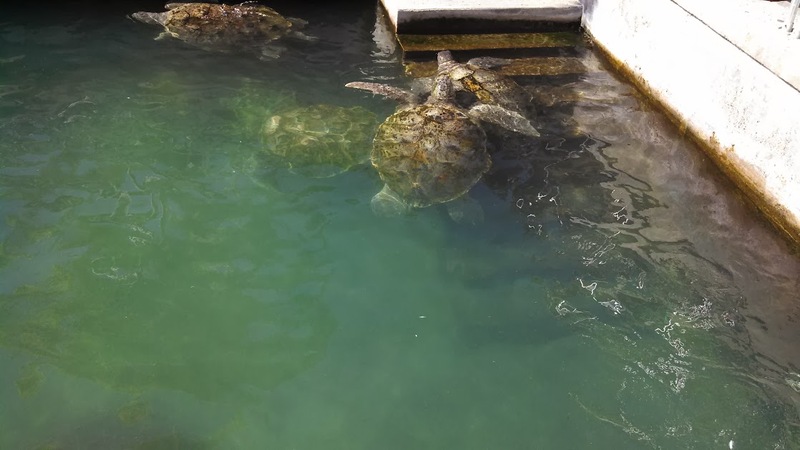 I went to two places of note on Cayman; Hell and the Turtle Farm. 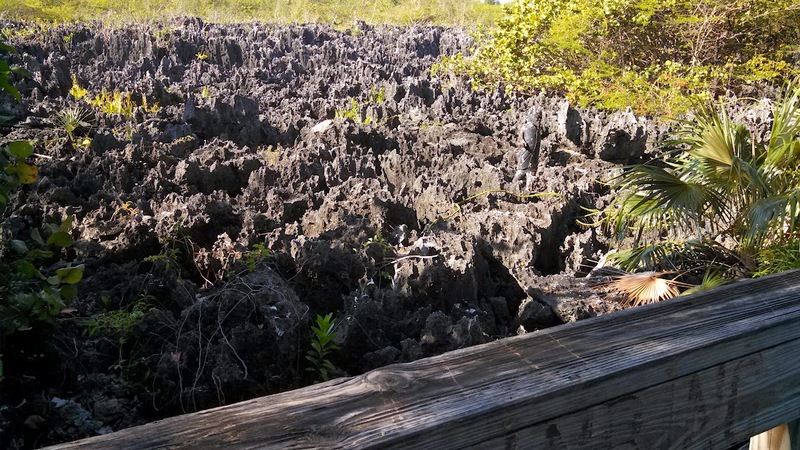 In the Cayman Islands is a stretch known as “The Devil’s Rock” in a town called Hell (and yes, they sell postcards saying “I went to Hell!” and other such things). It’s an area of the island where the Cayman’s volcanic origins can be seen. The area has these vast fields of jagged, volcanic formed rock deposits. Now, these deposits and strata only come up to your knees, or maybe your chest in some areas, but if I enlarge the size of these formations I suddenly have a maze of canyons and caves that complicate a scene, and provides shelter, hazards, and resources to use in a game. PCs find themselves in a blasted canyon, surrounded by lava-formed spires. Having just escaped a secret Imperial facility they run through the maze-like formation desperately trying to return to the crater where their ship was stored while being chased by stormtroopers on foot, scout troopers on speeder bikes, and TIEs or airspeeders flying recon and cover from above. Perhaps it’s a long trek back to the ship, and they need to find cover in the upper-levels of the formations in shallow caves because at night the rains come and flood the canyon in rushing white-water. "Will look cute for NOMS!" 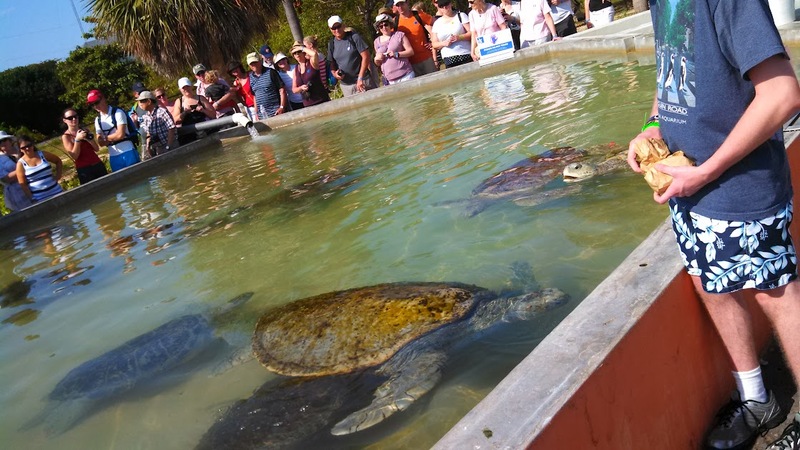 The second area I went was the Cayman Island Turtle Farm; a place where they breed giant sea turtles. I love turtles. I have a turtle (who’s old enough to buy alcohol and may have to be willed to a descendant). These beasties were adorable. Giant monsters of the sea swimming around and growing to be breeders, released into the oceans, or as food for the locals. Swimming over each other for turtle-chow provided by the tourists. I know I can come up with ideas for a location or scene from this; a similar facility for some critter on some planet, but honestly I just want an excuse to put sea turtles in my blog. 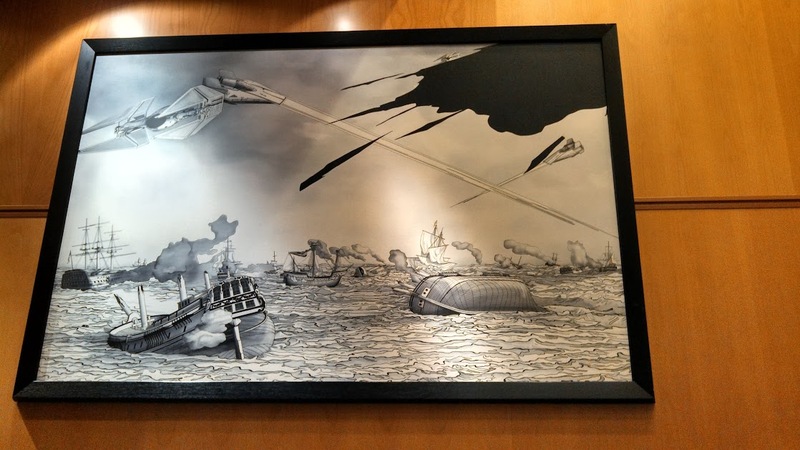 "If we can figure out this 'stairs' thing, we're golden..."
Ship pulls into port and "BOOM! ", instant skyline! I didn’t really do much in Jamaica. 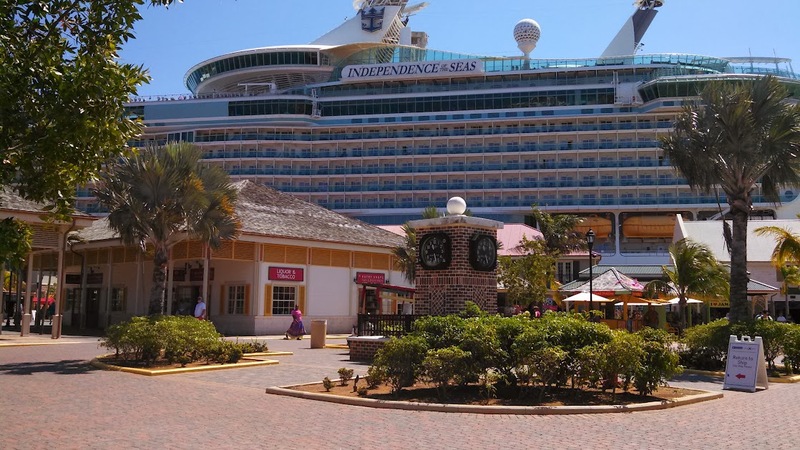 We docked right at the shopping district, and while excursions went out to various adventure zones and sight-seeing locations I really didn’t have the cash to do any of that. I did discover that there’s a figure more revered than Jesus in Jamaica, and that’s Bob Marley. He was everywhere, and on everything. I kinda wonder how he would feel about all this, to be up there with the commercialized images of Che Guevara, Elvis, and Jesus. As recognized as Coca-Cola and as loved as the Pope. Bob Marley’s got a weird following, man. It’s surreal. As I mentioned, I didn’t have the cash or interest really to go on any shore excursions in Jamaica, so I went to the Diamond’s International building to abuse their free wifi and apparently open bar. That is where I met Anthony. Anthony is a 6’2” Jamaican, possibly 150 pounds with giant hands, a strong grip, and a boat-load of charisma and charm. Dark skin, a broad nose, and teeth that are cared for as best as possible in a region where kids grow up without much dental coverage. Anthony is a mixologist; the third best on the island (according to him). In a mixology competition of 120 bartenders, the only two people to beat him; the one that could juggle four bottles at once while pouring the perfect mixed drink without spilling a drop won first place, and the one that could do the same with three bottles won second. Anthony could only juggle two bottles while mixing the perfect drink, but he still beat out 117 others to “stand on the podium with a bronze”. He was hired by Diamonds International to keep their guests happy and well intoxicated, presumably keeping the husbands upstairs drunk with the free wifi and open bar while the wives run up the credit cards in the rest of the establishment (or vice-versa, it’s a world of attempted equality). Anthony mixes drinks, has manly talks with the folks who come into his area, and has a tip jar that is for “respect”. Whatever you get is free of charge. He simply instructs you to tip what you feel his service is worth. He’ll serve you water, a Coke, a Red Stripe, or a delightful rum-and-coke (“Jamaican style or American style?” “…American, I eventually have to walk again.”) His favorite concoction is Absolut Apple, coconut rum, and a dash of peach schnapps over ice where you sip it, then just before or after you swallow inhale the fumes rising off your tongue. Gets you buzzed nice and fast, and goes down SMOOTH for something composed entirely of alcohol and ice. Anthony has been doing this job for ten years, and he loves it. “Where else can you come ta work, meet people from all over da world, and drink? I get to make people happy. It da best job in da world, mon, and I would not trade fo’ any-ting.” He hasn’t had a vacation in as long as he can remember (“What do ya do when you take a vacation from a job like dis?”). If he does go on one he might like to try skiing, but he hates being cold (So basically, he’s screwed). He flirts with his co-workers. He street races on Sundays. And more than anything in the world, he dreams of the day when someone walks into his bar and makes the pronouncement “Anthony, I want to get DRUNK.” He lives for the day when someone walks up to his bar and says that they want to drink until they have to be carried out of there. It will make him the happiest mixologist on the island. If that doesn’t scream “Flavorful NPC” or “PC Backstory” to you…well, turn in your dice now and go back to playing MMOs. 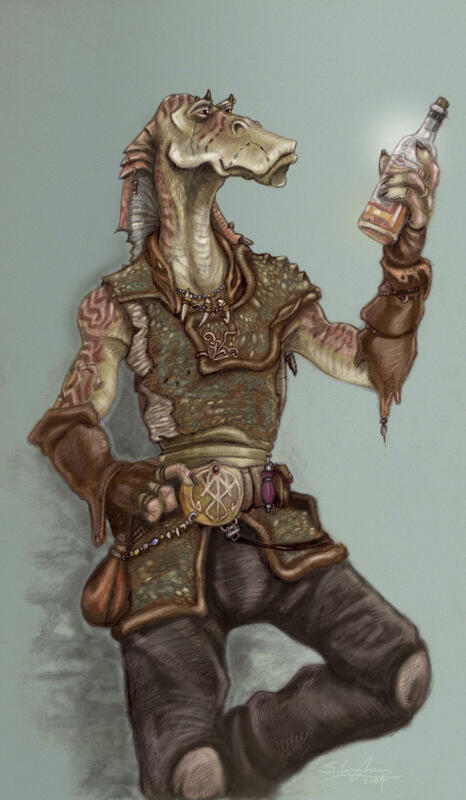 I could do the stereotype and make such a character Gungan, or maybe Duros, or Neimoidian, or keep them human. Lose the accent. Keep the accent. Whichever! See? Inspiration wherever you go, and from whoever you meet. 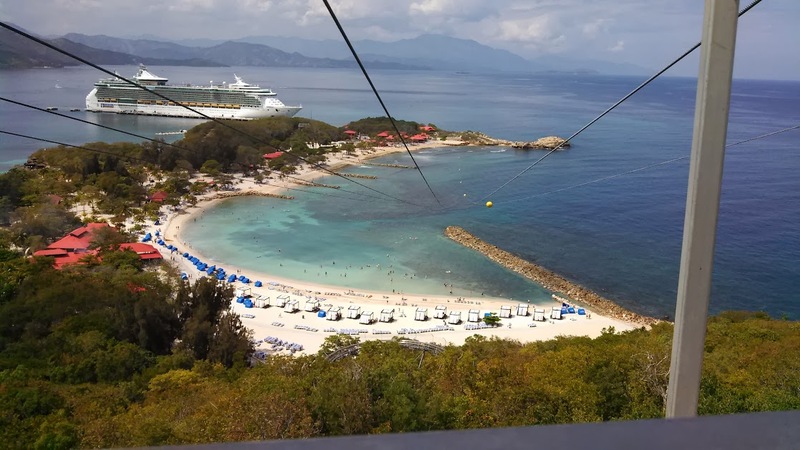 The private enclave for Royal Caribbean, Labadie is isolated from much of Haiti. Few excursions leave the area. The resort-port is walled off, with armed boats patrolling just outside of view of most beach-goers to keep natives from approaching the beach to sell wares or to try and sneak onto the cruise-ship. But aside from that, the place was a paradise! Joking aside, I did get a few ideas from Labadie. The first is some of the views and terrain. 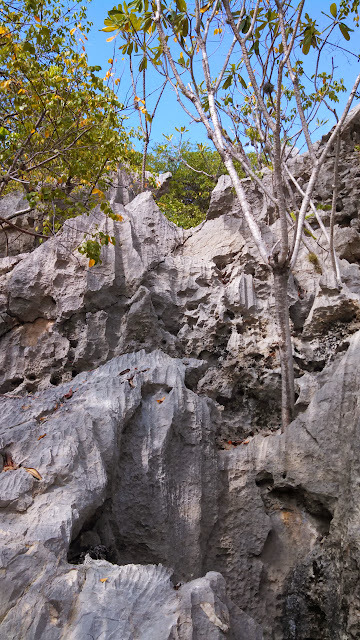 Unlike the Cayman Islands, the Isle of Hispaniola has many mountains, and also has the similar volcanic rock formations as Hell. More fuel for my maze-chase scene. You know what else is fuel for games? The attractions. Labadie has a 2000+ foot zip-line called The Dragon’s Breath that drops you 300 feet and goes out over the swimmer’s lagoon. It’s the longest zip-line in the world to go over open water (my brother rode the longest one, currently. Alaska. Just about a mile long). Riding this line was craaaaaazzy fun, and the view was unbelievable. Couple that with the Dragon Coaster, an alpine one-or-two person coaster ride on a track that zips you back and forth through the jungle canopy. You control the break, and the speed. Supposedly you can ride it without needing to use the break, but wow is it a rough ride and one that really makes you question “how well are the safety systems on this thing?” I used the brakes, not only because I didn’t want to see if I could fly off the track car-and-all but because the view from the coaster is almost as good as the one from the zip-line. Now; imagine using these in a game. The heroes need to infiltrate a secure base, and there are communication lines running from within their compound up to a relay station on a hill. Or while escaping a mining camp there are several carts that carry workers from the mine entrance at the top of a mountain to the base camp below. Carts that are gravity driven with only a brake and a prayer to the Force to keep folks on the track. Yeah. That’ll do. That’ll do nicely. I won’t do another talk about ideas gained at sea (partially because this post is kinda long already), but I will say this; game ideas come from anywhere. As I write this, I find out that there’s trouble in the Ukraine, and that all the good-will from the Sochi Olympics is dissolving into a return to Cold War feelings. That California, which suffered weeks of drought, now has so much rain it can’t handle the floods and mudslides. They’re evening forecasting tornadoes in the Golden State. The news is another good source of ideas for your games. I’ve got a post-it note on my monitor to have a raging brushfire in one of my game sessions at some point; a reminder of how dangerous nature can be as part of a story or as the main antagonist. So yeah, get out there and get inspiration for your games wherever you go. Oh, and if you ever do find yourself Falmouth, Jamaica, go upstairs at Diamonds International and ask for Anthony. Tell him you want to GET DRUNK. You will see the happiest Jamaican on the island, mon.